The Amazonia Arizona 9 Piece Wood Outdoor Dining Set with 93″ Oval Table and 8 Stackable Chairs is a large, solid, well-constructed dining set made of high-quality eucalyptus wood, which comfortably accommodates up to eight guests for outdoor dining and entertaining — and thanks to its eight stackable chairs and fold-down extension table, makes for easy storage during the off-seasons. 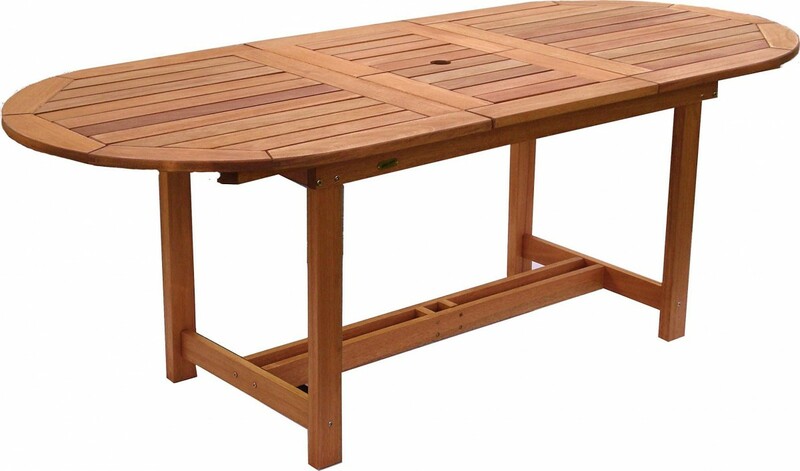 Made of high-quality, durable, eucalyptus wood (Eucalyptus Grandis), which is a dense, extremely tough hardwood that is naturally resistant to weather and UV radiation, the Amazonia Arizona 9 Piece Wood Outdoor Dining Set with 93″ Oval Table and 8 Stackable Chairs is ideal for any climate, and is produced from sustainably grown eucalyptus from well-managed, FSC-certified forests in Brazil for peace of mind. 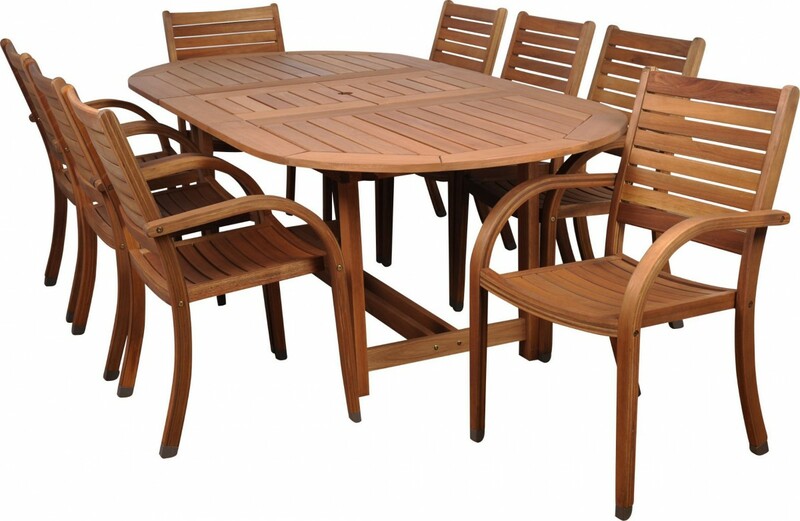 Featuring an extendable oval table with butterfly leaf, which flexibly extends from 71-inches long, to an impressive 93-inches long for large get-togethers with extended family (and which folds back down again to save space), the Amazonia Arizona 9 Piece Wood Outdoor Dining Set with 93″ Oval Table and 8 Stackable Chairs also includes a 2-inch umbrella hole in the table (and at the bottom of the table’s frame for extra support), to protect your guests on those really sunny days whilst enjoying the outdoors. 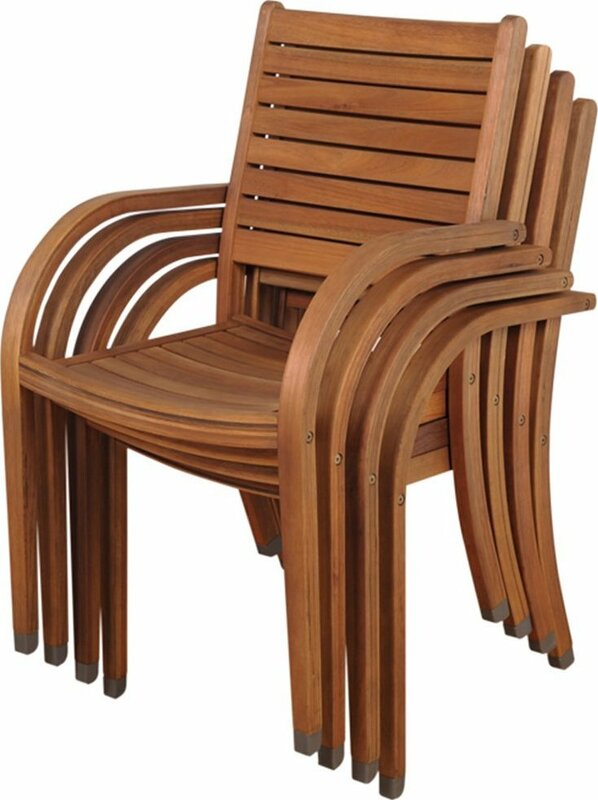 Also featuring 8 stackable armchairs with sloping arms and curved seats, which are comfortable with or without cushions, and make for easy storage, the Amazonia Arizona 9 Piece Wood Outdoor Dining Set with 93″ Oval Table and 8 Stackable Chairs provides lots of flexibility when entertaining with family and friends, and is sure to be an inviting centerpiece for your outdoor space for many years to come. 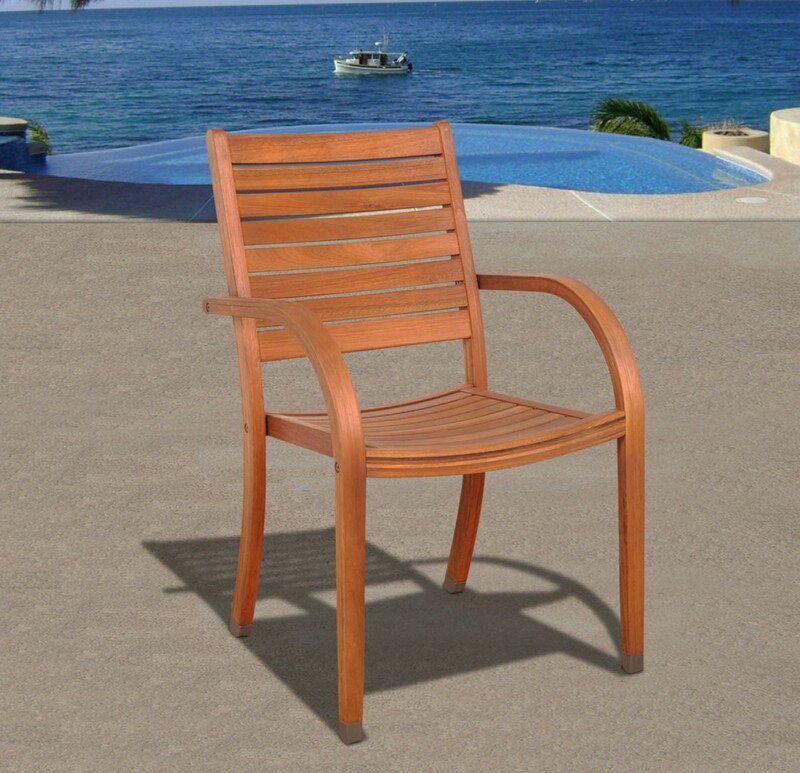 Including rubber protectors on the end of each chair leg, which makes the chairs easier to slide in and out, and protects the surfaces of your patio or deck, the Amazonia Arizona 9 Piece Wood Outdoor Dining Set with 93″ Oval Table and 8 Stackable Chairs is an all-round winner for value, style, comfort, durability and usability, and is sure to bring about many compliments as you enjoy it with friends and neighbors. 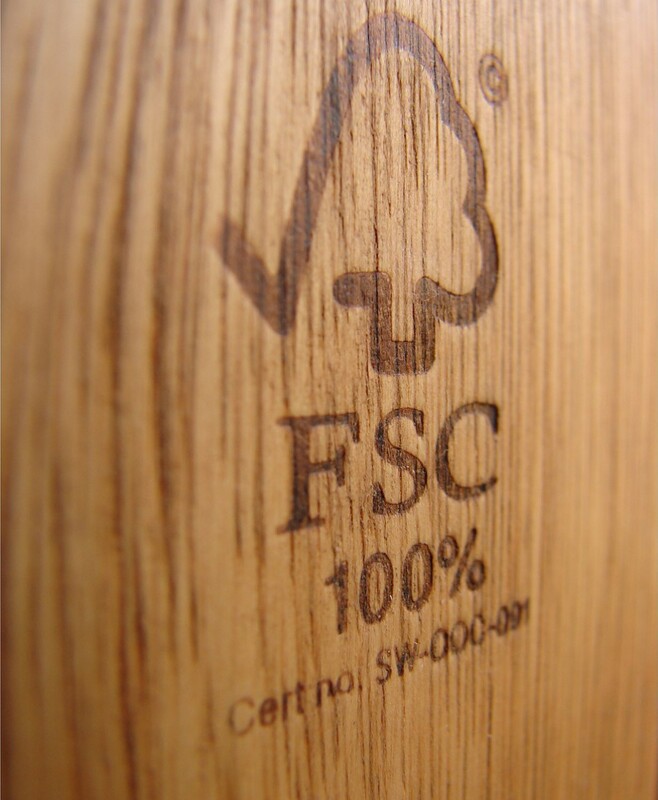 Also including a complementary bottle of Amazonia liquid sealer/protector, which helps preserve the color of the eucalyptus wood, and which works great to protect against the effects of air pollution, mildew growth and salt air, the Amazonia Arizona 9 Piece Wood Outdoor Dining Set with 93″ Oval Table and 8 Stackable Chairs can also simply be left in its natural state, which if kept outdoors, will weather to a nice, silvery gray patina. 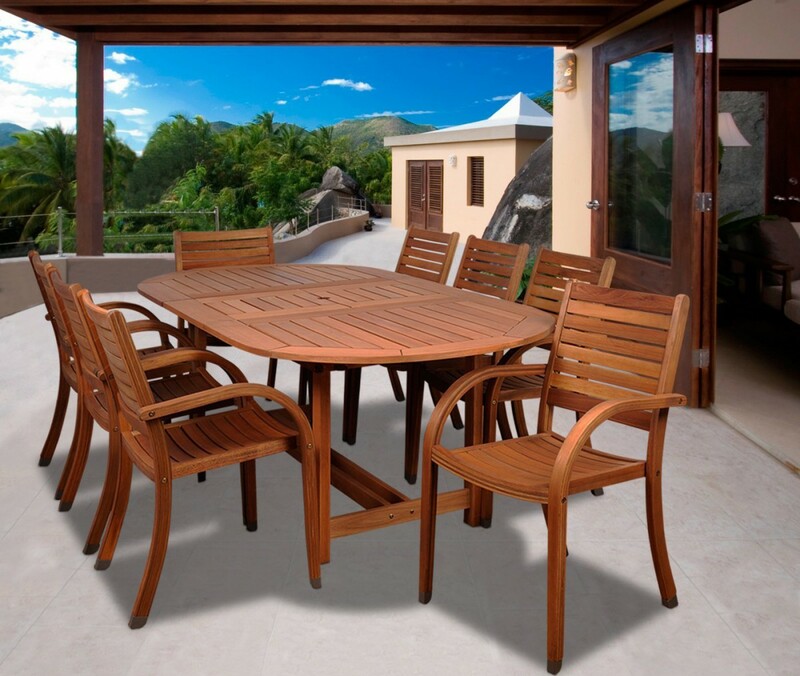 With quick and easy assembly, that only involves putting together the frame for the table top (the chairs come stacked and pre-assembled), the Amazonia Arizona 9 Piece Wood Outdoor Dining Set with 93″ Oval Table and 8 Stackable Chairs comes with galvanized steel hardware for the table’s frame, includes a 1 year warranty against manufacturing defects, and is a best seller over at Amazon.com (rated 4.3 out of 5 stars from 9 *rave* customer reviews) with FREE shipping. Click to see current price.